Pro Balance: It offers digestion support with a probiotic, ginger and immune support with organic blueberries, organic mushrooms and calcium from algae. 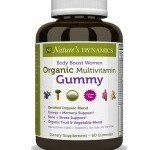 Body Boost Woman Organic Multivitamin Gummy A mix of natural vitamins and minerals with organic berries, spices and vegetables. Does not contain dyes or trans fats. Body Boost Mens Organic Multivitamin Gummy Also a mix of natural vitamins and minerals with organic berries, spices and vegetables.For the men it includes Organic Saw Palmetto for prostrate support. Does not contain dyes or trans fats. Berry Garden Gummies: Vitamin and minerals in a gummy with no gluten and non GMO. Also no dyes, trans fat or colors. Great for children with allergies. Opinion: These supplements have excellent ingredients with no fillers. If you are looking for a really good multivitamin for yourself and your kids these are the products to choose. I have seen many different multi vitamins out there that have fillers, dyes and unnecessary ingredients that don’t have much to offer. This is not one of them. All the products have really good organic ingredients. Especially if you have a child who doesn’t like to take a pill these products are perfect. Nature’s Dynamics is a family owned and operated company that safely and effectively develops 100% natural whole food gummy supplements with organics for consumers. We are proud to say that all our products are GMP certified and produced in the United States. Nature’s Dynamics researched botanical and medical studies from around the world when creating all of our high quality gummy products. Nature’s Dynamics believes vitamins, minerals and nutrients should be delivered to our bodies through spices, botanicals, fruits and vegetables grown in the earth’s soil and not from manufactured synthetic chemical vitamins. Beside supporting global initiatives, such as organic farming, rainforest preservation and third world food programs, Nature’s Dynamics supports local programs that improve the quality of lives for individuals in our community. Natures Dynamics is the global leader in cutting edge delivery systems of organic whole food supplements for consumers. 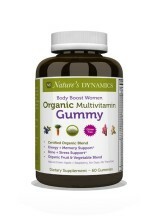 Natures Dynamics manufactures a full line of Gummy Supplements made with organic ingredients along with chewable and vegetarian cap Probiotics. Our Gummy and Probiotic supplements taste great, but most importantly are easy to digest and absorb. Natures Dynamics believes your vitamin supplements should come from organic whole foods, spices & botanicals delivered in a food based form. Synthetic, single isolate vitamin pills, gummies and powders are hard to digest, utilize by the body, must be taken with food and may cause upset stomachs.